One of the best parts of summer is hanging out with friends on the porch, in the backyard, or on the patio. But is your space up to scratch? If you ignored it for most of spring, it may still need a little TLC. Here are some tips for tidying up your outdoor space this summer. Pick up Debris. Whether fallen branches, especially from summer storms, leaves left over from winter (or even fall), toys, or pet mess, pick up all the most obvious things before you go any farther. This is a great project for kids to help with. Lawn and Garden Care. Now it’s time to prune, weed, rake, and mow everything. Trim the trees, cut the grass, get rid of the weeds, and rake like you’ve never raked before! Patio/Porch Care. Sweep and vacuum your patio or porch. If your porch is particularly in need of cleaning, or you’re feeling particularly energetic, consider mopping or even scrubbing it–or at least hosing it down. Furniture Care. Tend to your outdoor furniture, either by wiping down plastic, throwing slipcovers in the washing machine, or vacuuming padded chairs. If you discover mildew problems, a little white vinegar in a spray bottle will help take care of it. Check out our other cleaning hacks. Once you’ve done that, call Mr. Junk! Piles of lawn debris, broken toys, and furniture that can’t be salvaged have to go somewhere, so contact Mr. Junk for a free quote and to schedule a pickup! With the right care, your outdoor space can be a wonderful addition to your home, especially in the summer and fall. Let Mr. 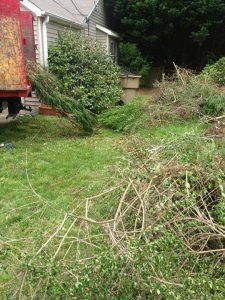 Junk help with all your junk removal in the metro Atlanta area!